The posterior most part of the heart tube is commonly known as the sinus venosus which receives the venous blood from the right and left side of the embryo. 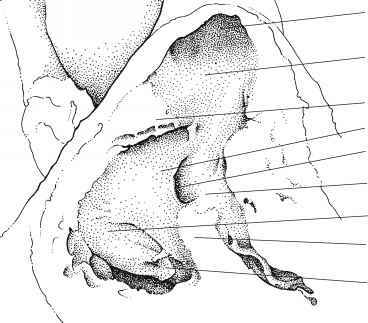 It consists of two horns connected to the rest of the heart tube via the sinu-atrial foramen [Steding et al., 1990]. These horns receive blood from the vitelline, umbilical and common cardinal veins. Reconstructions of the venous pole of the heart in mouse embryos, based on molecular expression patterns in the surrounding myocardium, have shown that, at least in mice, a sinus venosus sensu stricto does not exist at any time in development. Instead, the systemic venous tributaries, i.c. the right and left sinus horns, drain separately and directly into the atria [Soufan et al., 2004]. Whether this situation is comparable to what occurs in human embryos remains to be proven. In this atlas we will therefore conform to the current opinion regarding development of the venous pole in man. In contrast to what is seen in most vertebrate embryos, asymmetry of the venous pole in human embryos, with the left sinus horn being deviated to the right, appears to be present from the beginning onward [Knauth et al., 2002]. When viewed from the luminal side of the heart tube, a bifurcation is seen where the two horns meet [Vernall, 1962; Steding, 1990], like the crotch in a pair of trousers [Webb, 1998]. This structure is called the sinus septum and is situated caudal to the dorsal mesocardium. From stage 12 onwards the superior caval vein is being formed by the right superior cardinal and right common cardinal vein. The proximal portion of the inferior cardinal vein develops from the right omphalomesenteric vein which is intergrated into the (right) hepatic vein. This becomes the most cranial part of the newly formed inferior caval vein. The left sided counterparts steadily regress. At the same time the sinus venosus becomes integrated into the right atrium. The sinus septum, initially a midline structure in the same sagittal plane as the dorsal mesocardium, turns almost 90° to the right. Eventually, the sinus venosus will drain completely to the right atrium, including the left sinus horn, which in humans will become the coronary sinus. In fact, the central part of the sinus venosus is to become the greater part of the mature right atrium. This part remains smooth-walled in contrast to the pectinate musculature of the auricles. By the end of stage 11, a fold of tissue is formed at the caudal margin of the sinu-atrial foramen, which will become the right sinus valve. The sinus septum separates this valve in two parts that flank the orifices of the right and left sinus horns. Later on, these parts develop into the Eustachian and Thebesian valves that flank the orifices of the inferior caval vein and the coronary sinus, respectively. At the junction of these valves a fibrous structure is formed, called the tendon of Todaro, which, as observed in mouse embryos, runs through the sinus septum and terminates at the site where the primary interatrial septum will fuse with the atrioven-tricular cushions [Webb et al., 1998b]. Although both sinus valves are generally considered to result from incorporation of the sinus horns into the atrium, it has been suggested that, in contrast to the right sinus valve, the left sinus valve, which is formed at the cranial margin of the sinu-atrial foramen, is not formed by folding but by ingrow of a myocardial protrusion [Wessels et al., 2000]. In their superior most aspect the right and left venous valves fuse to form the spurious septum, that flanks the inlet of the future superior caval vein, will eventually be incorporated into the terminal crest, which separates the auricle from the rest of the right atrium. The remainder of the left venous valve fuses with the atrial septum by the end of the embryonic period. What part of the heart is formed by the sinus venosus?